Created by CNY Hiking, this guide comes to you as a pdf file that you can either print out or send it to your smart phone or Kindle. 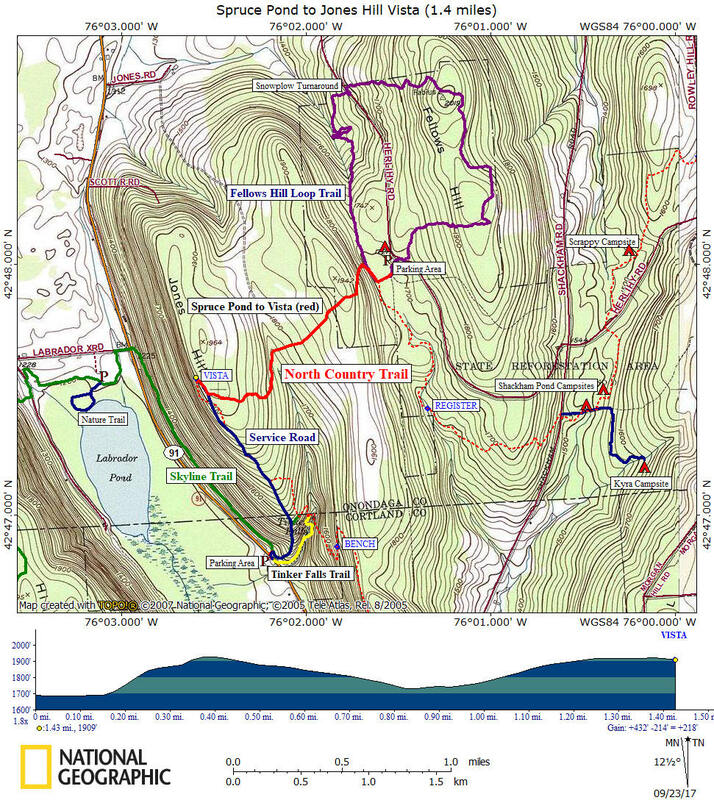 You'll have maps & info on hikes at Morgan Hill State Forest at your finger tips. Use the Buy Now button below and we'll send you the pdf file via email usually within 24 hours of payment. A great 2.8 mile out and back hike that follows the blue blazes of the North Country National Scenic Trail. The hike begins in Morgan Hill State Forest, takes you past beautiful Spruce Pond, onto private property then into Labrador Hollow Unique Area to your final destination of the spectacular views from the "hang glider spot" on Jones Hill. Be sure to bring a blanket & lunch to spend some time enjoying the views. You'll find out quickly why this is one of the best sections of the North Country Trail in NY, as well as one of the most popular hiking destinations in Onondaga County if not all of Central New York. There is a 432 foot elevation gain for this hike. Also take some time while in the area to check out Tinker Falls & Labrador Pond in Labrador Hollow Unique Area. DIRECTIONS: From Tully, NY take NY 80 EAST through Apulia. Take a right on Herlihy Road. This road will become a seasonal dirt road as you enter Morgan Hill State Forest. Continue straight (veer right) at a Y junction and pass Spruce Pond on your right. There is a parking area on your right for about 8 cars. The GPS coordinates are N42 47.961 W76 01.534 for the Spruce Pond parking area. See the map and hike description below. This hike is in solid red on the map. There are a couple of pictures and a video of this hike below as well. From the Spruce Pond Parking Area take the well worn path over earthen dam. North Country Trail Kiosk. Turn right and follow blue blazes. 0.2 1693 feet Junction of orange blazed Fellows Hill Trail. Veer left and ascend steeply. Leaving Morgan Hill State Forest. Reach service road. Turn right and follow dirt road to the open clearing at the hang glider jump off. Reach clearing and the hang glider spot. Views to the west. Retrace your steps to return to your vehicle for a three mile round trip hike. The top of Tinker Falls is another one mile along the North Country Trail. If you decide to continue to Tinker Falls this will make your hike five miles round trip. Also spend some time in Labrador Hollow Unique Area.